For reduction of chlorine, chloramines, dirt, rust and silt and other taste and odor concerns. Chlorine can bond with proteins in our skin, hair, and other organs, causing oxidation to our cells, dryness and brittleness. Chlorine can be breathed in by the lungs, absorbed by the skin, and consumed in the water we drink. This unit is custom sized for you with the correct volume of media to give you the maximum contact time, the most thorough reduction rate possible, and a flow rate that meets your water usage needs. It treats water coming into the whole house for better water at your shower & bath, kitchen faucet, and garden. No clogging, will maintain consistant flow rate throughout life of the media, unlike cartridge filters that may build up trapped particulates, slow down water flow, and need to be changed before carbon medium is exhausted. All systems custom designed for individual circumstances. Valve type and media volume calculated for optimum removal of contaminants. 1.) A POINT OF ENTRY USPW GAC SYSTEM. Cost of Unit: $800 to $2500 (depending on sizing) plus labor. Needs to be sized by a technician. Piping sizes are 1", 1 1/2", 2" etc. up to 4" for a huge household or small community. Dual filter assembly: 2 housings containing two 10"H x 4"Diam or 20"H x 4"Diam Carbon Block filters. No electricity to the unit (garage or storage), No accessible drain line. Cost savings over the GAC, Customer wants to be able to change their own filters. Extremely efficient - 5 seconds contact time regardless of hardness level. Conventional Ion Exchange resin requires 90 seconds. No salt or other regenerants required. No water waste from backwashing. No brine discharge. Can be used in areas where conventional water softeners are banned. No control valve or electricity required. 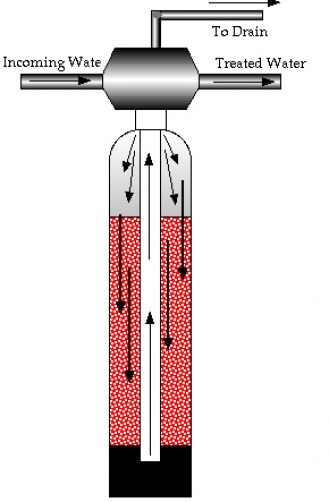 Media can be used in both conventional mineral tanks or POU cartridge form. Media operates in upflow condition. Scale Stop has proven itself in a variety of applications as an alternative to ion exchange softening or other conventional water treatment methods. The maintenance-free characteristics make it especially suited for Foodservice and Commercial applications where equipment maintenance is often overlooked. next-ScaleStop is a great alternative for residential use, especially in areas with brine discharge restrictions or where brackish water makes it impossible to operate a conventional softener. Laundry - reduced soap usage, cleaner clothes. Dishwasher - reduced soap usage, less spotting, no scale formation. Water Heater - complete protection from scale. Drinking water - beneficial minerals are retained, no sodium or other chemicals added to water. Water conditioning and softening is a point of Entry Technology that removes hardness minerals; calcium and magnesium using the ion exchange process, replacing them with sodium potassium. It does not greatly improve water for consumption but softens it so calcium deposits do not damage appliances.